It is Maljković’s larger body of work, which you only get a glimpse of at the Renaissance Society, that is the main attraction. What is “Also on View” are the different objects representing his varied and diverse practice, drawing on a range from painting, photography, video, sculpture, sound, and in some cases hybrids like “A Long Day for the Form” (2012–2014), which is a bronze sculpture nestled in a pile of styrofoam. The closer you get to the piece, the louder the sounds of crickets chirping become in your ears. Designed and laid out in collaboration with Karsten Lund, curator and longtime admirer of the artist’s work, the exhibition is less a display of an artist’s trajectory and more an experiment in layout. 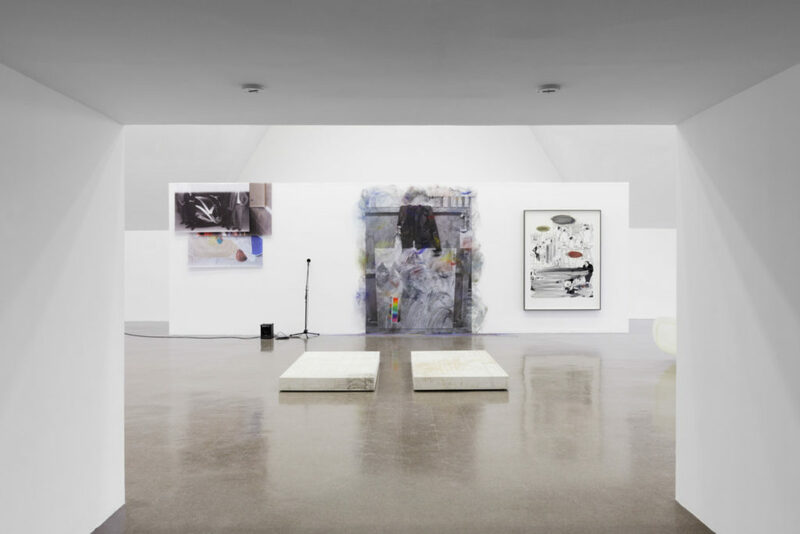 There are several pieces titled “Alterity Lines” that come from a show with the same name that took place last year at Metro Pictures in New York. Three of the pieces from this show are HD video animations with no sound. In an interview with the Weekly, Maljković described how these pieces grew out of sketches that he was initially unsatisfied with. “Frustrated Painter or Something about Painting” (2003–2018) offers another glimpse into process. Using PS Blue Back wallpaper (a paper in a brilliant color that pops), pigment, and wheat paste, Maljković recreated an image that was previously shown at Metro Pictures for the Renaissance Society exhibition. In his artist talk at the opening reception, Maljković shared the story of how this piece stemmed from a performance he did while working on a painting. He shared a brief vignette of how he struggled to come up with a piece and instead chose to present a performance using the blank canvas as a prop on top of which he placed a black leather jacket. For the piece at the Ren, Maljković adds hints of color to the black and white sketch. For Maljković, the exhibition itself acts as a medium. The dates on many of the pieces span several years, showing how the artist has been working on them for an extended time. Every iteration is a revelation for him. Maljković is interested in the methodology used to make a piece, or even exploring the perception of an artist rather than the work itself. Take for instance another piece: “Untitled” (2014), a fiberglass mold of Peugeot Moovie Car. The French car manufacturer Peugeot manufactured a series of concept cars that were not practical to drive. Intrigued, Maljković launched an artist investigation into the process, visiting the facility and filming workers attempting to drive the car on an empty road. Maljković shared images from this project in his artist talk. There is an absurdist notion raised in the presentation of Maljković’s works and the way in which they serve as artifacts of lived experiences rather than designed, conceptualized objects that embody an artist’s statement or practice. All of the pieces that Maljković produces, regardless of medium, hold within them individual pieces of a larger puzzle. Every piece pushes the boundaries of sculpture and tangibility of a work of art in that they feel tactile but can’t really be touched because of the value they possess. Instead, Maljković wants the viewer to experience the object by engaging with the ideas he is presenting to them. Using curatorial practice as a medium, he responds to the space. His work and presentation reframe the space instead of treating it like a blank canvas laid out for him to adorn with his work. He takes the unusual curvatures in the ceiling, the cross ventilation, the little corners that intrigue the viewer, and makes the viewer conscious of the physical space which both viewer and object occupy. Manisha AR is the Weekly’s chief of staff and a writer who graduated from the New Arts Journalism program at the School of the Art Institute of Chicago. She is interested in film, video, performances and storytelling. Her last story for the Weekly was on Shadi Abib Allah’s show at the Renaissance Society last fall.